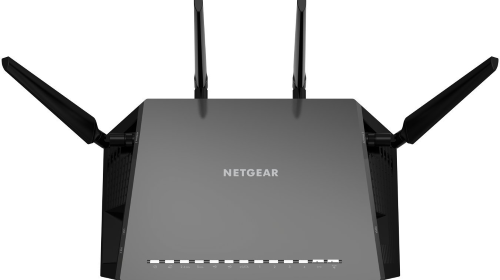 The quad stream NETGEAR AC2600 Nighthawk X4S R7800 802.11AC wireless router is the successor to last year’s AC2350 Nighthawk X4 R7500 (and R7500v2). Besides a bump in “S”, for Smart, the Nighthawk X4S also jumps to the dual-core 1.7GHz Qualcomm IPQ8065, adds 200MHz of theoretical bandwidth to the 2.4GHz radio (800Mbps + 1733Mbps = AC2600) by increasing to 4×4 in both bands, and enables 160MHz channel width for 5GHz. Priced at $270/£230 SRP ($260/£213 street) the Nighthawk X4S R7800 looks to be a solid contender for the mid-range performance 802.11AC router market, and with Wave 2 features like MU-MIMO enabled out-of-the-box (OOTB) a fair degree of future proofing. 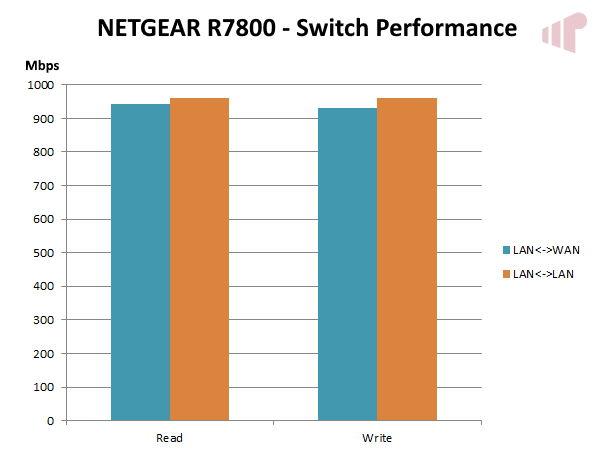 On first glance the NETGEAR Nighthawk X4S R7800 is nearly identical to the R7500, but there is one notable tweak. The antennas are marked with their intended position on the device; making it much more difficult to install them in the wrong location. The 802.11AC wireless router offers all the connectivity we have come to expect in this range, including four Gigabit LAN and one Gigabit WAN Ethernet, and two USB 3.0 / one eSATA ports for attaching storage. It also includes one of my favorite features on a Wi-Fi router – a switch to turn off all but the power LED (why can’t it also disable power?). Making it possible to reduce light pollution in operation. Perfect for those who install in light sensitive areas. Bidirectional screw slots are found on the underside for wall mounting the router, and the 12V/3.5A power cord is a reasonable 6’ long. At 7.3-10.1W, power draw is consistent with this class. First-run is simple and straight forward. The NETGEAR Nighthawk 4XS R7800 highjacks all DNS requests, redirecting traffic to it until the basic setup is confirmed. This forces at least a basic walk through of the configuration as well as a firmware update check. This is a great thing, but NETGEAR misses the opportunity to force a password change as well; leaving it set to “password” which is less than ideal. The Nighthawk X4S R7800’s UI is classic NETGEAR. Functional and serviceable with all the basics like Parental Controls, VPN, port forwarding, dynamic DNS, intelligent QoS (Quality of Service), etc., but lacking in more advanced network management features, or depth in the features that are present. Taking Parental Controls as an example. The feature is there, but leans quite heavily on OpenDNS’s safe-listing schemes for control, a keyword based scheme for URL blocking, and blanket whole-network access scheduling. While this does work, it is a too blunt an instrument. Lacking the fine grained control of other platforms to specifically target at the device level (i.e. MAC/IP), so it is not possible to block network access from 8PM to 8AM for my son’s phone without also shutting down everything else. This level of granularity is also missing when it comes to network filtering. Services can only be blocked using an all-or-nothing approach. There is no way to explicitly block either a specific external IP address for a client, or even at the network level directly. Now, it is possible to approximate this feature at the network level (i.e. for all clients) using static routes to nowhere (null route), but it would be better to expose the functionality directly. Guest wireless is another area where I would like to see more control. It works correctly if the Nighthawk X4S R7800 is configured to act as the network’s DHCP and DNS server, but if you disable the router’s DHCP server and use an alternate DNS configuration, guest wireless will not function unless you allow clients to access the LAN; defeating one of the main goals (network segmentation) of enabling it. While I understand that this is not a common use case, it highlights the inflexibility in the current implementation. Spinning up a discrete subnet + DHCP/DNS infrastructure per Guest network would be much more robust. Fortunately, like other Nighthawk routers, NETGEAR provides an alternative firmware via myopenrouter.com; in this case OpenWRT. As an open source Wi-Fi router firmware base on Linux, it provides endless flexibility and potential for end-user control. But, the learning curve is steep, with many things require editing text based configuration files or beyond a basic knowledge of network configuration, so it is not very approachable for most users. Also, the version NETGEAR provides is quite old (12.x R7800 v. 15.x latest), so it can be difficult to extend the functionality beyond what is provided from the build of OpenWRT NETGEAR provides. That said, I still think it is fantastic that the option is there for power users, but clearly not ideal for everyone. Also, if you install OpenWRT you give up one of the major “value-add” features of NETGEAR Nighthawk routers; ReadySHARE Vault. ReadySHARE is NETGEAR’s name for router attached storage. In the case of the Nighthawk X4S R7800, it supports USB 3.0 and eSATA external drives. Once attached the drives turn the router into a budget NAS device, albeit with no redundancy, like many other devices in this class. 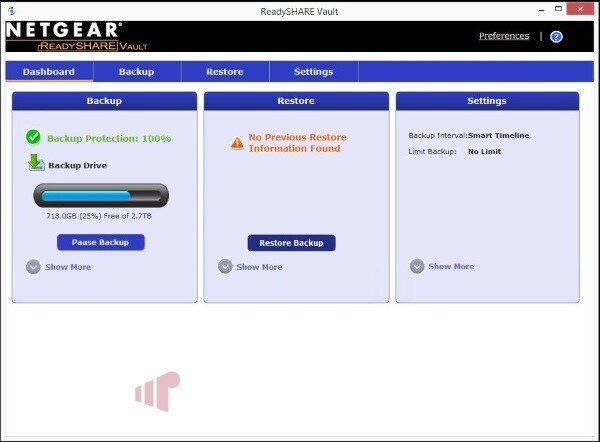 But, NETGEAR has a killer application for the storage in the form of ReadySHARE VAULT. Which is a system tray application for PC that can backup data folders; providing point in time backup and rollback for monitored files. Performance was tested using a real-world testing methodology, where a large file is copied from one side of the wireless gap to the other. Testing utilizes SSD equipped PCs via their Wi-Fi adapter or Gigabit Ethernet (for media bridge testing) with average bandwidth for the period represented in the charts below. It should be noted that the distance markers are not strictly linear. They represent locations in a two-story brick/plaster home with solid plaster/block (i.e. not stud + dry wall) internal walls; with 1-30’ on the ground floor and 35-50’ on the floor above. 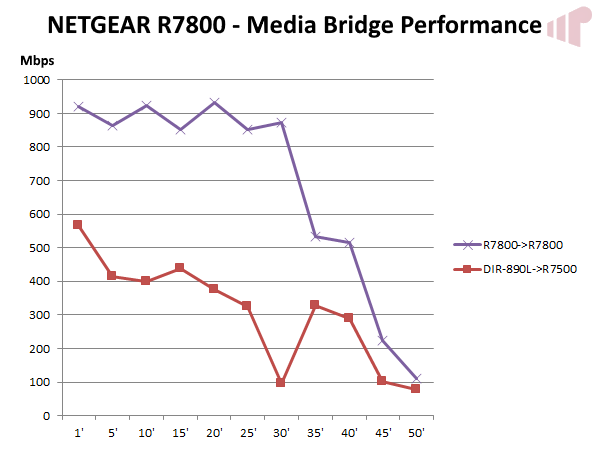 Media bridge performance is critical for anyone who needs to maximize network performance in a fixed location and wires are not an available option. This is an area where the NETGEAR R7800 really shines, with its performance as an 802.11AC media bridge simply outstanding. Producing near 1Gbps actual throughput in each of the 1-30’ testing points on the ground floor; making it the fastest media bridge I have tested. Even after going up a level, the R7800->R7800 media bridge exhibits very solid performance, besting the DIR-890L->R7500 combo throughout. The R7800->R7800 combo clearly demonstrates the performance potential, and difference between 1733Mbps and 1300Mbps (theoretical) 802.11AC technology. Media bridges are a fantastic option for network extension to a fixed location, but the most common use for Wi-Fi is to provide connectivity to clients that roam around – so 802.11AC 3×3 and 2×2 performance was also measured. Here we can see the results for 5GHz 3×3 (Broadcom) and 2×2 (Intel) clients, contrasted against the numbers recently produced with the DIR-890L and a 2×2 (Intel) client. 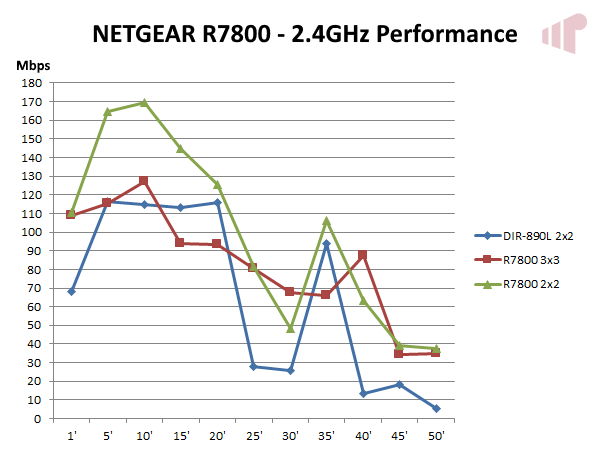 The results are clear here as well, with the NETGEAR R7800 showing a marked, general advantage at the extremes; up close, and especially further away from the router. With the R7800 able to provide coverage at 45’ & 50’ where the DIR-890L could not. This was not particularly surprising given the technical advantages, but the lack of a significant difference between 3×3 and 2×2 is quite intriguing given that 3×3 has a 433Mbps theoretical bandwidth advantage. It is also interesting to note that there was also no tangible difference when using 160MHz, versus the default 80MHz, channel width for the Broadcom adapter and the Intel was not able to reliably connect in that configuration. Hopefully both of these observations are due to driver issues, and will be sorted out by the respective vendors shortly. 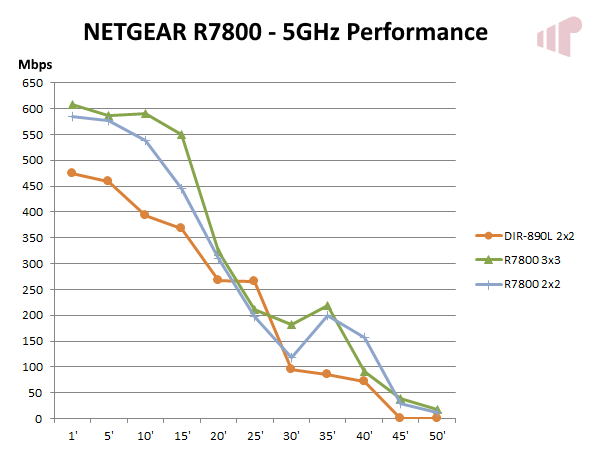 Moving to the 2.4GHz band, here again we see a range and performance advantage for the NETGEAR R7800 at greater than 40’. Producing greater real bandwidth in every location than the same adapter tested against the DIR-890L. The results from the 3×3 and 2×2 adapters even more confusing than in the 5GHz sample. Here again, I would have expected the Broadcom 3×3 adapter to produce significantly better results, but in most cases it lags behind the Intel 2×2 solution. As we have seen, Wave 2 802.11AC is very fast, with the NETGEAR Nighthawk X4S R7800 putting up the best results I have measured in single client media bridge and 2×2 PC testing. That said, if you have a lot of 5GHz clients it can make more sense to pick up a similarly priced “Tri-band” Wave 1 router instead. 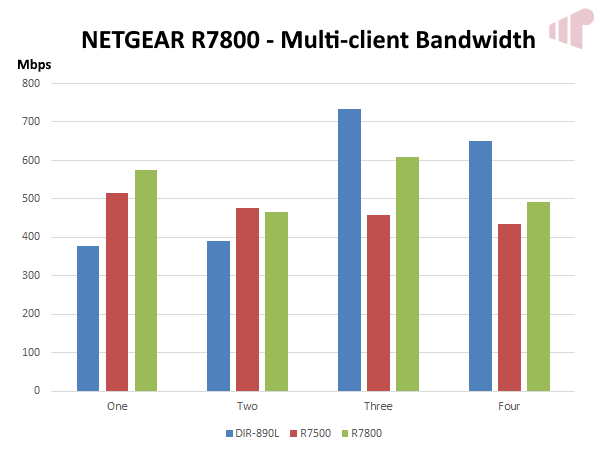 Looking at the numbers above representing aggregate multi-client bandwidth with the noted number of 2×2 clients, we can see that the R7800 holds up a bit better than the R7500 as load is added, but not nearly as well as the dual-5GHz radio DIR-890L. Unfortunately, I only have four 2×2 802.11AC systems to test with, as it would be quite interesting to run it out a bit further to see where the limits are. 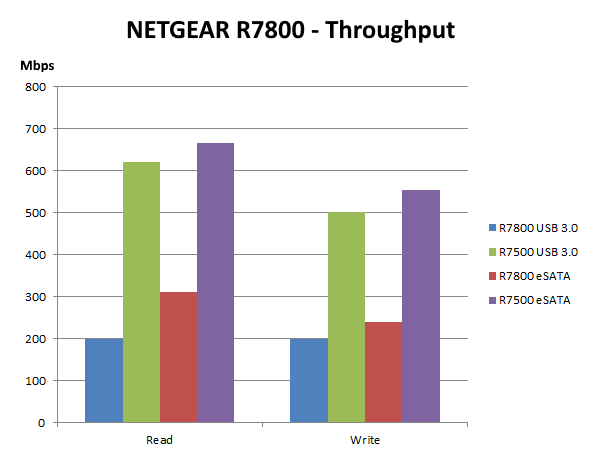 Where the NETGEAR Nighthawk X4S R7800 generally excels, attached storage I/O throughput is an interesting regression; most notable because of the Nighthawk X4 R7500’s performance. Still acceptable for streaming large media files, where 100Mbps is required, but it does mean the R7800 is a step backwards away from entry level NAS. It should also be noted that both the router and media bridge mode support attached storage. So there is flexibility to place the disc closest to the main consumption points. Lastly a look at switching performance both between LAN clients and LAN to WAN, where we can see the NETGEAR Nighthawk X4S R7800 achieving practical peak throughput. Like every device reviewed on Missing Remote, router stability is a key factor of the process. Frankly, performance comes second after this metric when it comes to home networking products. That we have not discussed any stability issues yet, should indicate that none were found, but I want to call it out specifically. Making sure it is clear. Where I would like to see richer parental controls, and more flexibility to configure the device without installing OpenWRT (which is fantastic to have as an option) and giving up ReadySHARE Vault, these points do not take away from the fact that the NETGEAR Nighthawk X4S R7800 is a solid, fast, and stable AC2600 802.11AC Wi-Fi router. In fact, the 5GHz performance of the R7800 is the fastest I have measured both in media bridge mode and using PC adapters. While we have yet to see wide-spread rollout of 802.11AC client that support the full feature set of the R7800, including MU-MIMO and 160MHz channel width, it is fantastic that these are implemented in the router, providing a credible foundation for meeting the demands of future devices. Thanks to NETGEAR for providing the review sample.